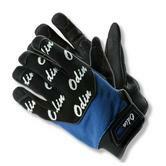 Topline gloves are made with premium quality microfibre, and antivibration padding in the palm. TPE attenuation in the innerhand. This anti vibration glove is ideal for work with light vibrating tools and work tasks that require light attenuation. Wenaas Odin Topline Vibrex Anti-Vibration Glove 6-6351 conforms to: EN420 EN388:2003 2.1.2.1. The Impacto 501-00 Fingerless Anti-Impact Glove Liner is made from four-way stretch polycotton. There is impact and shock absorbing Visco-elastic polymer "VEP" padding in the palm. Recommended to be worn under work glove. Provides protection from impact and vibration. Protects Palm Visco-elastic polymer padding. Open finger gloves provides full dexterity. Fingerless style leaves fi ngers open for tactile feedback and mobility. Great for protection from electric, manual and power tools in applications including construction, assembly, manufacturing, maintenance and warehousing. Impacto 501-00 Fingerless Anti-Impact Glove conformance with Norms: EN 420:2003+A1:2009 and EN 388:2003 3.2.3.1 standards. The Ansell Vibraguard 07-112 gloves reduces vibration energy transmission to the palm and fingers. Ideal for those tasks involving vibrations at frequency levels greater than 300 Hz. These gloves offer resistance to cuts, punctures, abrasion and repelling grease and oil. Velcro adjustable fastening on back for flexibility and comfort. Perfect for working with tools such as heavy duty hammers,hand grinders,drills and impact hammers. Quality fingerless Gel gloves from B-Brand. 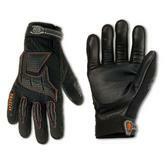 Leather palm and gel inserts - combination of comfort and safety protection. Terry towel backing providing a secure comfortable fit. Ideal for use with power tools, Sport or Gym use. Fingerless Gel Anti-Vibration Gloves PGL98GL. Quality fingerless Gel gloves. Leather palm and gel inserts. Terry towel backing. Comfort fit. Ideal for use with power tools. Sport or gymnasium use. The unique coating on the glove reduces the effects of impact, shocks and vibration. The soft knitted seamless liner is very comfortable to wear over long periods of time. The open back allows for excellent breathability. Tremor-Low gives the wearer a greater level of dexterity. The foamed coating provides an excellent level of grip. Elasticated knitted wrist offers a secure fit and protects hands from dust and debris. Protective gloves against mechanical vibration and shock. Polyco Tremor-Low 867 Neoprene Foam Coated Anti-Vibration Gloves conform to standard BS EN 388:2003 and EN 10819. The Ergodyne 9015 Anti-Vibration gloves reduces vibration energy transmission to the palm and fingers. Exclusive patented Nu2O2 polymer protects from maximum shock, impact and vibration. PVC shell on the back of the hand for extra protection. Micro-injected closure for quick cinching. For perfect fit : Woven elastic cuff. 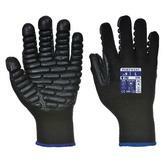 Pigskin leather fingers and palm for rugged wear and abrasion resistance. Specially designed to reduce the effects of impact and vibration. Excellent levels of comfort and dexterity when using Powertools. Perfect Anti-Vibration gloves for jack hammers, concrete breakers etc. CE certified Portwest A790 Impact Anti-Vibration glove conforms to EN 420; EN 388 (X.3.4.3.) and EN 10819 (TRm=0.62 TRh=0.55). Vibrex, Vibraguard, Anti vibration - these are all terms relating to the shock-absorbing nature of gloves. The Impacto brand is still the market leader, but the Ergodyne has to be the king of the hill for shock absorbing, anti vibration glove quality and design. EN 10819 is the vibration protection or anti vibration standard, according to which anti vibration gloves minimise shock. Anti vibration gloves minimize vibrations across 3 axes (,Y and Z) when the user uses vibrating or rotating equipment within a frequency range of 32 Hz to 1000 Hz. Wenaas gloves range for all your needs Wenaas range Gloves Blog.